August 9 on Main Street in Middletown, CT.
(Middletown, CT) Rich Greco, a longtime volunteer for the Middlesex County Chamber of Commerce is a man who likes his motorcycles. 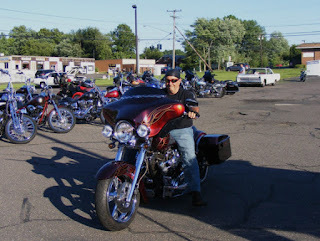 Greco rides a dark cherry red Thunder Mountain Frontier Custom Harley Bagger. He purchased it used in 2013, but since 1969 has hit up the road on many bikes since he first got his motorcycle license at age 21. Greco is preparing to see more bikes on Wednesday, August 9th as Middletown Motorcycle Mania begins its 12th year at 4:30 p.m. on Main Street in Middletown, Connecticut. Often seen zig-zagging on a golf cart donated by Lyman Golf, Greco stops by each vendor site on Main Street to make sure the event logistics are running smoothly. At last year’s car cruise event he wore a referee shirt he purchased so he could be easily spotted by the other volunteers and Middlesex Chamber staff. Identified by his wide smile while serving as a happy warrior, Greco has become a familiar fixture at downtown Middletown events, volunteering at Middletown’s Holiday on Main to Middletown’s Cruise Night on Main, and Middletown’s Motorcycle Mania, where he is currently serving his fifth term as chairman of the event. He first joined the committee in 2009 as a volunteer and worked his way up in involvement. “Some of the more difficult parts is the setup, getting vendors and everyone in their place. Everyone wants to get in early. I’m wearing three to four hats, but need to be in 40 different places,’ said Greco. The Middletown native got acquainted with the event as a member of the Middlesex County Chamber of Commerce, joining during his time in finance and insurance sales in the county. “Rich is an integral part of all our downtown Middletown events, the time that he puts in volunteering is simply outstanding and we are so thankful for his hard work,” said President of the Middlesex County Chamber of Commerce Larry McHugh. Retired in 2012, but very active as a volunteer, the father of two sons is a grandparent to two grandsons and two granddaughters. He has been married to his wife Ruth for 46 years. He also keeps a part time job as a ranger/starter at Lyman Golf, another position where his golf cart prowess is useful. Motorcycle Mania, though, is the pinnacle of his volunteering. The 12th Annual Middletown Motorcycle Mania is Wednesday, August 9 on Main Street Middletown from 4:30 pm. to 8:30 p.m. This event, presented by Hunter’s Ambulance, Hunter Limousines Ltd. & the Hunter Family, is held in memory of a founding sponsor, Dan M. Hunter, and is driven by Haymond Law. There is an entry donation of $10 per motorcycle, and $15 for bikes entered for awards, which benefits Middletown youth programs.